Lori Hairston: You Are Berry Sweet! If you love bright pink, then this might be the card for you. It is certainly pink! Now I love pink, so this works for me and I love that sweet Strawberry Girl and the pink plaid. Isn't she fun and a little unusual? I took a cue from her jumper and added some white embossed swirlies and chicken scratch to the pinks - breaking it up a little bit and adding some fun detail. Of course, Strawberry Girl is a download and I hope you have as much fun with her as I have. I turned her into a birthday card for my mom. The sentiment is a part of Strawberry Girl's download. I like her really big so that the detail on her jumper and the strawberries on her hat show up. She ended up being a little larger than my largest oval die. So when I die cut the oval, I cut off the very top of her bow and the strawberry leaves. I cut out those leftover pieces and taped them back in place at the top of the oval. That's kind of fun! 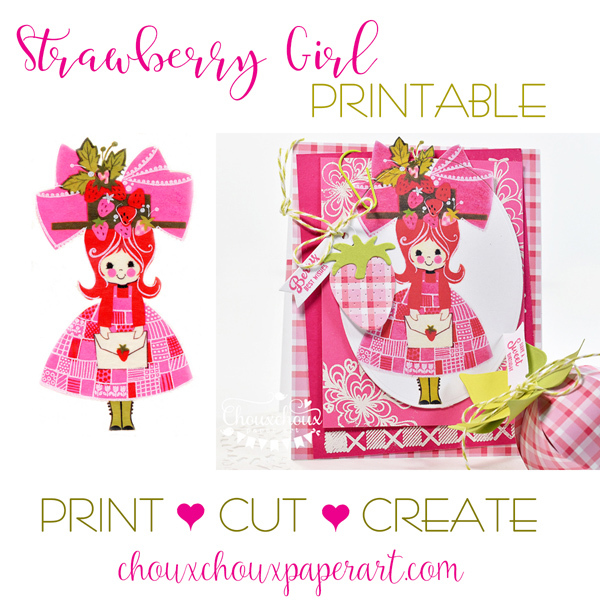 Maybe you know someone who would love a Strawberry Girl card or a tag attached to a goodie bag? So glad you stopped by. And have a wonderful week! 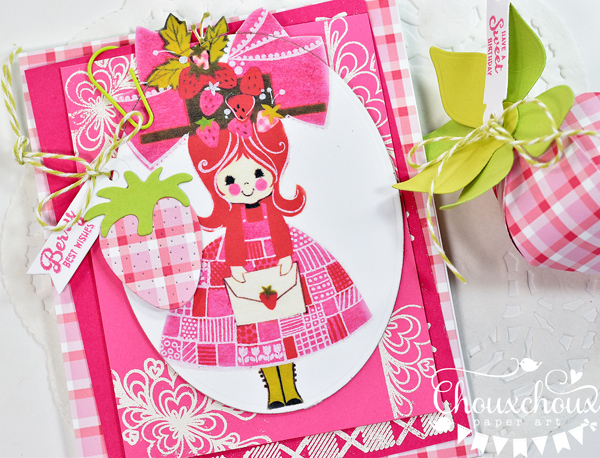 Oh wow--yes I do love pink & I love your projects, Lori! The PTI images in the background are perfect (need to use mine!) & I love the gingham strawberry! Your mom is going to treasure this! Soooo sweet card, Lori!!! Your Mum surely will LOVE it! Love all the pink and the cute retro girl! Well done cutting the bow and then pasting it in place! Fab and fun plaid straswberry too! What a cutie. Pink isn't one of my favourite colours but this looks such fun. What an adorable make. 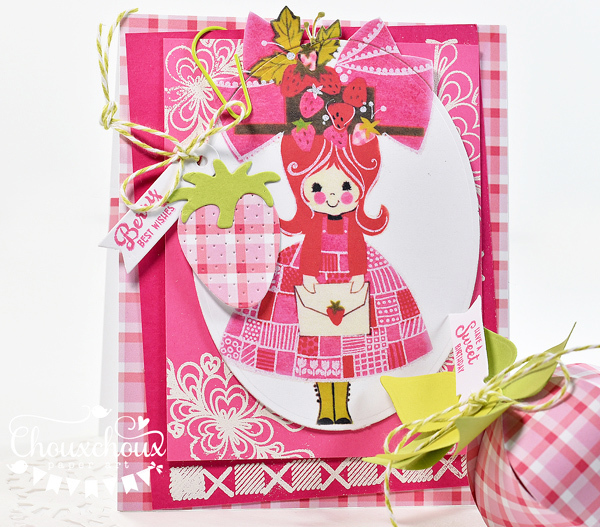 she is "berry" sweet for sure and your card is absolutely gorgeous!! You are "berry" sweet and it shows in everything you do! Even though our styles are worlds apart, I love to follow you as you makes always put a smile in my face and in my heart!! Oh, yes...love pink! And, your card with the girl is pink is just the sweetest, Lori! Love all the strawberries! Your Mom will love it I'm sure!! Love it; and love that pink; also the plaid strawberry. Too cute! This will satisfy any pink lover. LOL Hugs! Omgoodness, she is adorable! And so are your fabulous projects, Lori! Love her vintage retro look, and love the homespun feel with all the plaid. The white embossed details you added to the card were such a great idea. Really pulls out the detail in the sweet image. Love that little strawberry box, too. Your mom is going to have a very happy birthday with these treats coming her way! Aaah! Adorable!! It's those details like what you did with the hat... I didn't even notice it and when I read that I went back and looked and yup... that's what made it so awesome.. love! 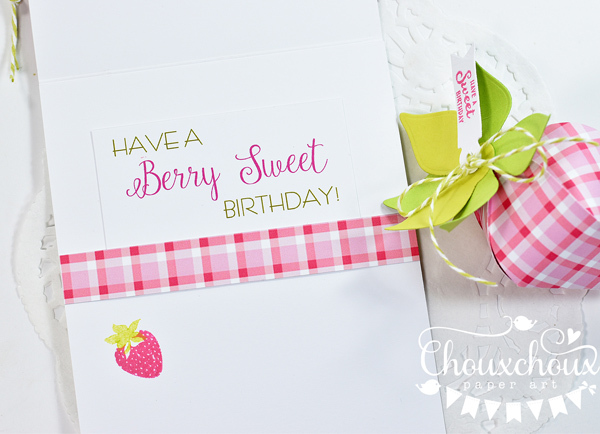 Oh my gosh...this card is "Berry Sweet" So pretty n pink! What Should a Mom Do?